MUCH will be written this week about Leonard and Helen Prior, who unwittingly became through no fault of their own, the most famous Britons living in Spain. 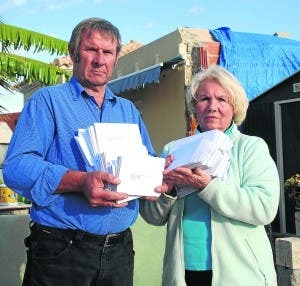 Their fame came cruelly when their dream three-bedroom home was demolished in a cowardly and stupid miscalculation back in Almeria in January 2008. Yet the Priors home was NOT on a flood-plain. It was NOT in a place of singular beauty, NOR was it on the beach or on any plan for expropriation. The Priors were – and are – a simple British couple who had retired to Spain, after a professional life in England that afforded them a reasonable retirement egg. They had planned to move here to enjoy their twilight years with a glass of red wine as the sun sank each evening over the hills before them. After getting planning permission through the usual method via their town hall, they invested €375,000 constructing their dream home complete with heated swimming pool and landscaped gardens… They even named it Tranquilidad (Tranquility). It’s not clear why their house was chosen and no other similarly-erected homes built around them faced the same treatment. Perhaps the 30-minute demolition was to send us expats a message? Perhaps they were foreigners, who would just disappear back to their own country. But they didn’t. They moved into the garage, making a home in the cramped stuffy lean-to, with hose-pipe water and a generator for electricity – as so many other retired foreigners have been tragically forced to do in Andalucía. They appeared on British TV, repeatedly. They were in all the British newspapers, repeatedly. They were recorded on the BBC and in other European media, repeatedly. Millions read about what the Spanish had done to an innocent couple in the final years of an uneventful life. The Olive Press was there every step of the way. 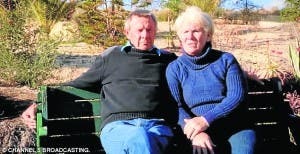 Now, once again, Leonard and Helen Prior are in the news. This time, even the Spanish news. A happy event, as the news has been billed: the judicial system here has blamed the local town hall. Not the perpetrators of the assault – those faceless morons at the Junta – but the local authority, who gave permission for the home to be built. The town hall must pay around half of the money claimed by the couple, and failing an appeal (which will surely be made), the Priors will be awarded enough to buy a smaller house somewhere – maybe in another more welcoming area! Unfortunately, the ‘costs’ – the gigantic legal fees (after over eight years) are to be shared. A much smaller house, maybe something nice in Morocco, or Romania. 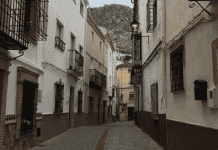 Andalucía is almost proud of its ‘300,000 illegal homes’: as if no one knew about these houses built mainly for speculation in this large and impoverished region. There are some 11,000 ‘irregular’ houses in the Axarquia, 12,000 in Almanzora Valley, in Almeria, and a whopping half of Chiclana’s residents, 40,000 of them, live in illegal dwellings. That is just three small areas. Most of the builders of these homes were protected, as often happens here, behind simple €3,000 limited-liability companies. Many of the mayors who gave out the licences – illegally and usually in return for backhanders – have had ludicrously low fines and small jail sentences… allowing them to get out and dig up hidden nest eggs of €500 notes buried around the Andalucian campo. Many foreign (and, to be fair, Spanish) buyers were caught in these traps: and the horror stories were told again and again in the foreign media, leading to millions, billions in fact of investment being cancelled, as buyers and investors stayed away. And it’s not just Andalucia, the problem of illegal builds is widespread across Spain while Cantabria and Galicia are also badly affected. The root of the cause of the problem is the complexities of Spain’s planning laws, builds going ahead with a lack of enforcement and legal action taking place much later. And, of course, the affliction of greed. While two new national laws, protecting those who buy in good faith, were put in place last year thanks to campaigning from residents groups, such as AUAN, they don’t protect those already bitten. So, how did the Junta (which ‘chips’ all the animals in the region, even the goats, and knows everything that must be known), fail to notice the construction of 300,000 houses, many even in large illegal urbanisations? And again huge development projects like the Los Merinos golf course, near Ronda, in a Unesco-protected area, or the Algarrobico hotel, on the beach, in a natural park? Few remember what Andalucia was like before all this concrete landed on us. So let’s not dwell on the poor Priors, the mere victims of circumstance. We should be sparing a thought for the Andalucian people. After all, how many jobs have been lost or will never be created, and how much money has not been invested in this region from abroad thanks to the actions of the Junta? And then there is, of course, the poor countryside that will never be the same. But nobody really thinks about that, do they? The greatest tragedy of all is that all the compensation in the world will not give Helen and Len Prior 8 years of their life back and the Junta de Andalucia are to blame for this entire situation. Why should any of these 300,000 properties be illegal anyway? What the hell else were they going to do with this land? You can’t grow anything worthwhile on it and it certainly is not an area of outstanding natural beauty but people (mostly northern Europeans) clearly want to live there so why not let them? Obviously they need to have proper planning laws in place and it has to be properly managed but if it attracts foreign investment and creates jobs and new businesses, why destroy it? Do I have sympathy for the people of Andalucia? Not if they voted PSOE or IU because if they did, they got what they voted for. I do have sympathy for the many people in provinces like Malaga and Almeria who desperately want change but are being held back by idiots that keep voting for the same deadbeat parties over and over again and getting the same deadbeat outcome. If something doesn’t change very soon, Andalucia will grind to a halt and become a Greek style basket case with fewer and fewer investors and virtually no new residential tourism. One huge problem is that once the older generation of expats die/go back to where they came from, there won’t be enough new people coming in to replace them. Why would anyone want to invest in a place that does this to people? The Junta de Andalucia is like a dead weight that holds people back and keeps them poor but unfortunately many are too stupid to realise it. Unless there is radical change, the future of Andalucia is very bleak indeed. 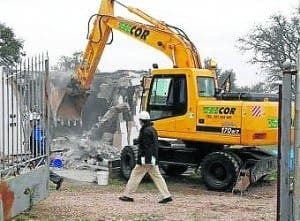 That day back in January 2008 when the bulldozer crept slowly towards the Priors’ house and took the first swing at the upper level marks the death of residential tourism in Andalucia. It makes me (and no doubt millions of others) shudder every time I see it on TV. This is a voice crying in the wilderness. During the boom years large numbers of Spaniards and expatriates cashed in on the lack of control and naive property buyers were the victims. Today a big crackdown is taking place on the corrupt elements in politics and local government. But this is not going to help the innocents who were defrauded by local town halls, builders, lawyers and the Junta. They worked in collusion as they lined their nests. You can be sure that the ill-gotten gains are stashed safely away out of reach of those who were swindled. The next Spanish government could act decisively to help out those who have suffered, by legalising thousands of properties bought in good faith by the innocents abroad. But…don’t hold your breath. Jane G, it is’nt just the Left that is corrupt, you will find that over Spain as a whole the record of the PP is far worse. Stuart, I take your point, it is the classic no choice, choice for the Spanish electorate. 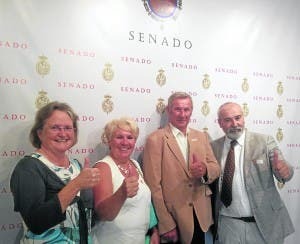 I agree that they are all corrupt but there is a unique problem in Andalucia whereby the same political party (PSOE) has governed the Junta de Andalucia for over 30 years and achieved absolutely nothing but complete failure – it’s almost laughable that they call themselves the Workers’ Party. Andalucia is the lowest ranking region on every level and in some cases for the whole of Europe. I think the cycle needs to be broken otherwise they might as well still be living in a dictatorship. Ciudadanos (C’s) have been very helpful to SOHA in trying to sort out this wretched problem so I think they are at least worth a try. People may not like everything about them or they may not like them at all but my advice is this, hold your nose and vote for anybody else otherwise PSOE have no competition and no accountability and you might as well not bother having regional elections at all because nothing will ever change. Given the choice, I would rather have a corrupt regional government that does not want to demolish my house than a corruption regional government that does. Andalucía, after 35 years of the PSOE, has the highest unemployment in the whole of Europe! not just Spain, but Europe! They seem to thrive on stopping jobs (unless they are creating even more public employees – funcionarios – whose main job seems to be making it harder for everyone else).